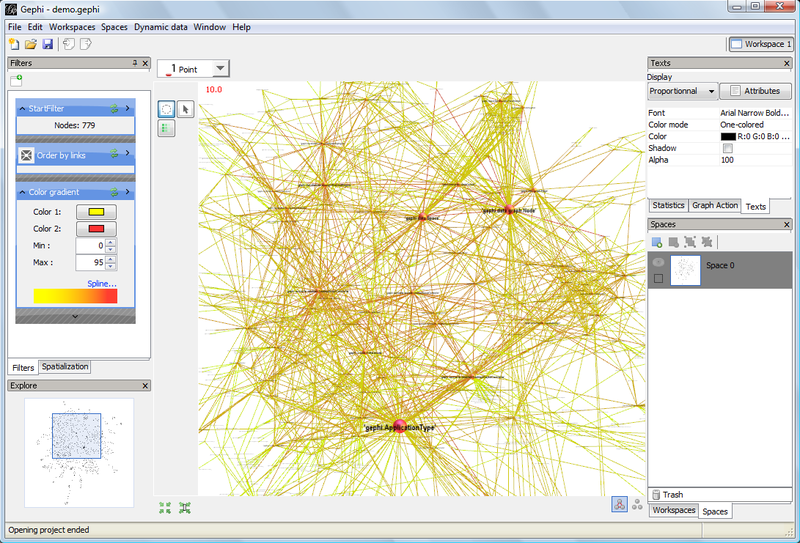 We released Gephi 0.6 Beta2 “Teddy Lion” today, second beta release of Gephi 0.6. It mainly enhances stability and improves existing features. Although we are already working on next major release 0.7, we decided to publish a second beta for 0.6 version. It is already a long time we are working on improving functionalities and stability of this version and this release marks our final point of achievement for 0.6 series. This beta is fully operational. Because we prefer concentrate on the new 0.7 version, no official 0.6 version will show up. The demo page has also been updated with this new version. Stay tuned for information about the new 0.7 version. - New text display "Proportional" mode. The size of labels follows node size. - Add Spring layout algorithm. - Add new node design, with an experimental photo panel. - Dynamic datasource now support all UPDATE operations. - Nodes added dynamically are now put in a "Dynamic space" instead of the trash. - Nodes labels have now correct position in 3D dimension. - Text display settings are now saved with project file. - Setting edge color from the "Properties..." menu. Set unique color and alpha. - Improve export dialog ergonomics. - Add a button to center the camera on zero. - Add proxy configuration in preferences. Proxy parameters are needed for the experimental photo panel. - Add new windows executable Gephi_extreme.exe with more default memory settings. It is intended to be used with manipulating very large graphs. - Fixed 'Force Atlas' algorithm. - Fixed many bugs and general stability.